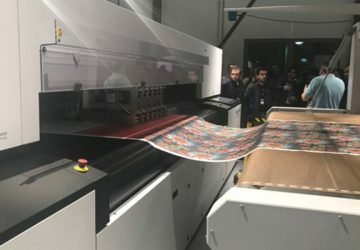 The brand-new, next-generation, single-pass EFI™ Reggiani BOLT textile digital printer from Electronics For Imaging, Inc. was launched recently during an open house event at the EFI Reggiani facility in Bergamo, Italy. 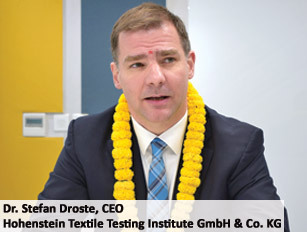 The advanced, ultra-high-speed digital single-pass printer has the potential to revolutionise the textile printing market, providing users with high uptime and reliability, outstanding performance, superior printing uniformity and accuracy, long printhead life and minimal maintenance needs. 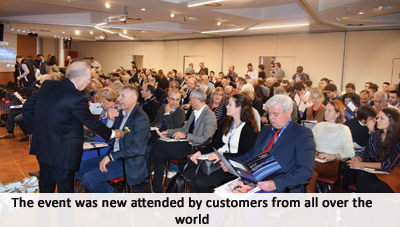 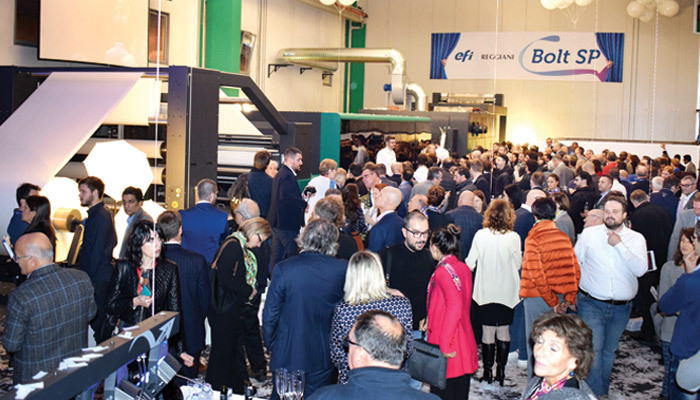 The EFI Reggiani open house created huge interest in global textile market opportunities, with nearly 300 customers and journalists attended to see the new BOLT in action. 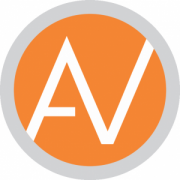 The BOLT offers an innovative, low-maintenance, fast-startup recirculation printhead that delivers better, more-uniform printing with superior uptime. 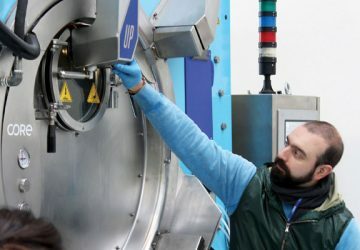 Thanks to its cuttingedge printhead concept and high-performance ink delivery system, the BOLT has throughput speeds of up to 90 mtr per minute (more than 8,000 sqmtr per hour) at a 600 x 600 dots per inch (dpi) resolution. 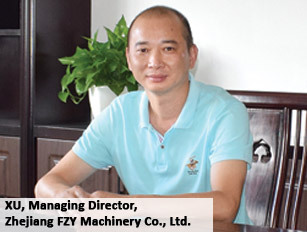 It features high-end greyscale imaging in drop sizes from 5 to 30 picolitres, and also provides premium-quality 600 x 4,800 maximum-dpi resolution printing, allowing customers to address the full range of design needs. 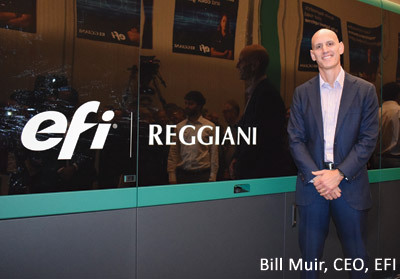 The printhead has been developed in partnership with a leading printhead manufacturer, and will be available exclusively for EFI Reggiani. 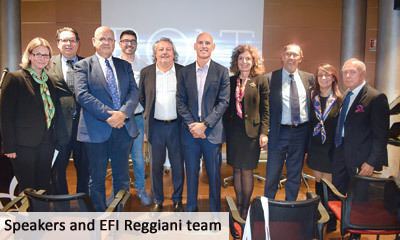 EFI Reggiani high-speed innovation in digital printing for textiles. 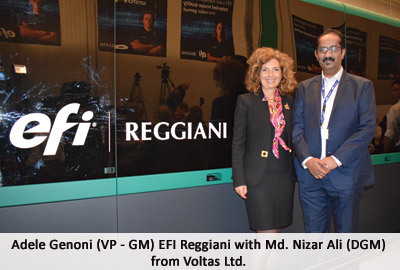 The BOLT printer is the newest in an important series of EFI Reggiani innovations. 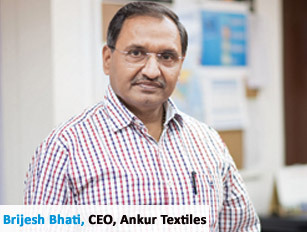 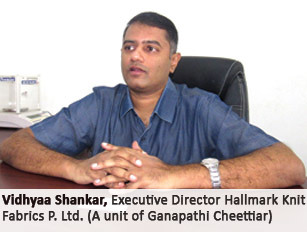 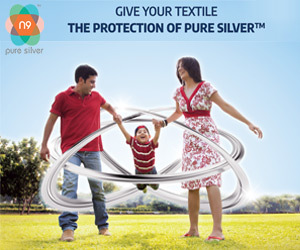 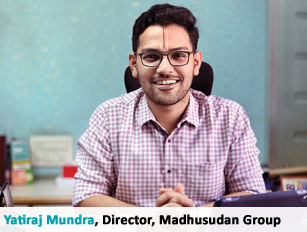 In the last 15 months, the team has developed a totally renewed range of digital scanning printers with cutting-edge technologies, launching a new model every quarter to offer customers solutions to whatever their requirements may be for easily scalable textile printing. 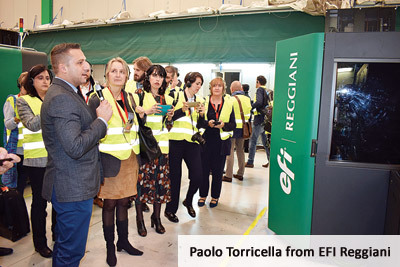 The list of EFI Reggiani advancements includes two recent launches – the COLOURS digital printer, which provides unparalleled performance with up to 12-colour printing, and the TERRA pigment ink with binder solution featuring inline polymerisation, a process that speeds up customers’ printing with one of the industry’s greenest production technologies.